As Memphis enters its third century, the expansive gateway created by two historic bridges highlights a mile of riverfront and the innovative culture of our city. An engineering marvel of its day, the Harahan Bridge opened in 1916 with a rail line in the center and a roadway for private vehicles on either side of the tracks. The bridge was rebuilt after a 1928 fire and remained the major river passage until the Memphis-Arkansas Bridge carrying Interstate 55 was constructed in 1949. Opened in 1973 and illuminated with its original bulb lights on September 5, 1986 by visionary local philanthropists, the Hernando De Soto Bridge has represented the iconic marquee of Memphis’ riverfront for decades and has been used countless times in nonprofit, corporate, and tourism promotions. Since its unveiling in 2016, it has been internationally awarded by both the Athens, Greece-juried American Architecture Award and the Waterfront Center Design Excellence Award. Featured in Fast Company demonstrating the correlation between lighting installations and greater economic development, the bridge’s lighting has become a top local tourism attraction with over 300,000 visitors per year. 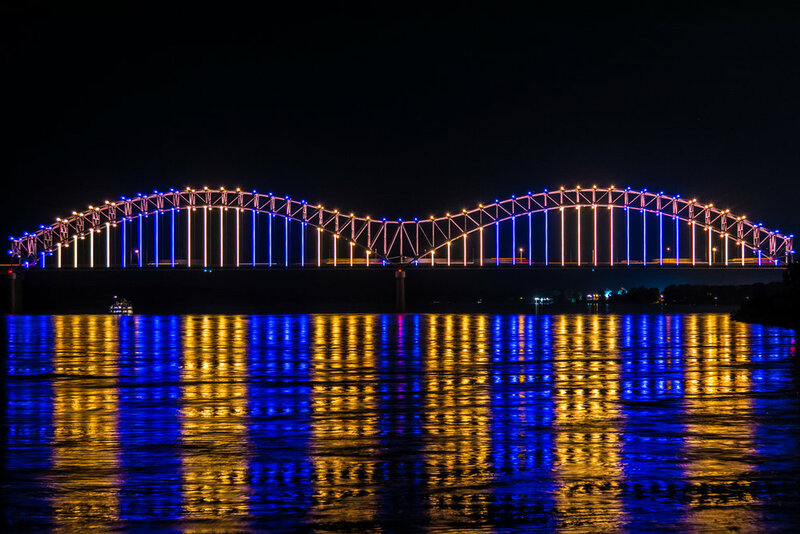 In 2016, Memphis Bridge Lighting, Inc. (MBL) was formed as a privately-funded nonprofit organization to use the lighting of our city’s bridges to promote activity on the riverfront and provide a unifying symbol of which all Memphians can be proud.